The mural is such a focal point when you enter the library, sometimes the other art in the building is overshadowed. 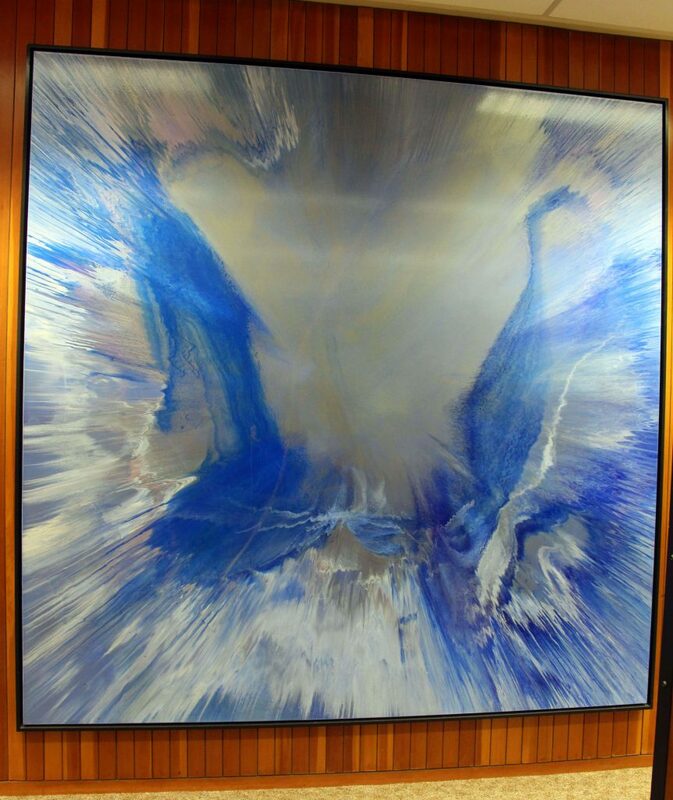 To highlight the other professional art pieces in the library, we’ve created an online gallery which details each work complete with information about the artist. Dicke is also the artist of one of the library’s most popular pieces. His untitled painting next to the current periodicals was created on a potter’s wheel, inspired by the Hubble Telescope. From a distance it gives the appearance of angel wings. Library visitors are fond of having their picture taken in front of the painting. Up close, the details look like a satellite photos. Another popular painting is by Francisco “Paco” Sainz. 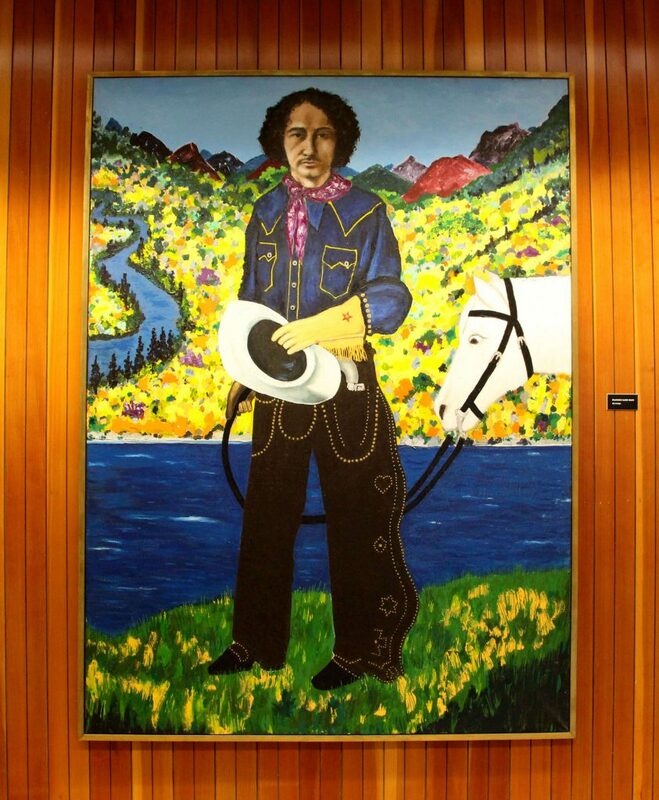 Sainz has multiple paintings on the wall near Alex Gallin-Parisi’s office but it is his painting, The Cowboy, which often evokes strong feelings of either love or hate. Some dislike it for its amateurish feel while others enjoy the childlike quality of the painting. The bright colors in this folklorist piece reflect Sainz’ memories of growing up in Spain. Holly Branstner’s large pieces in the Information Commons also stem from childhood memories. Her landscapes reflect her relationship with areas, many associated with her youth in Michigan. 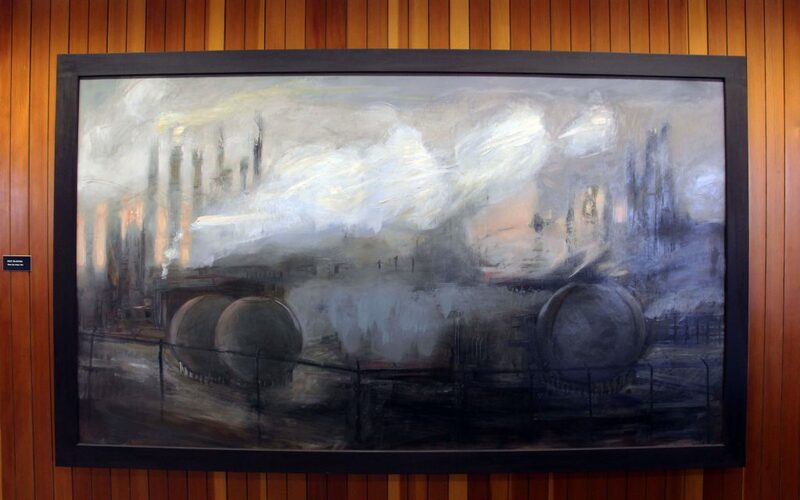 Other pieces of her work are influenced by the industrial landscape of Detroit and her current home state, Ohio. The mural is not the only artwork specifically created for the library. 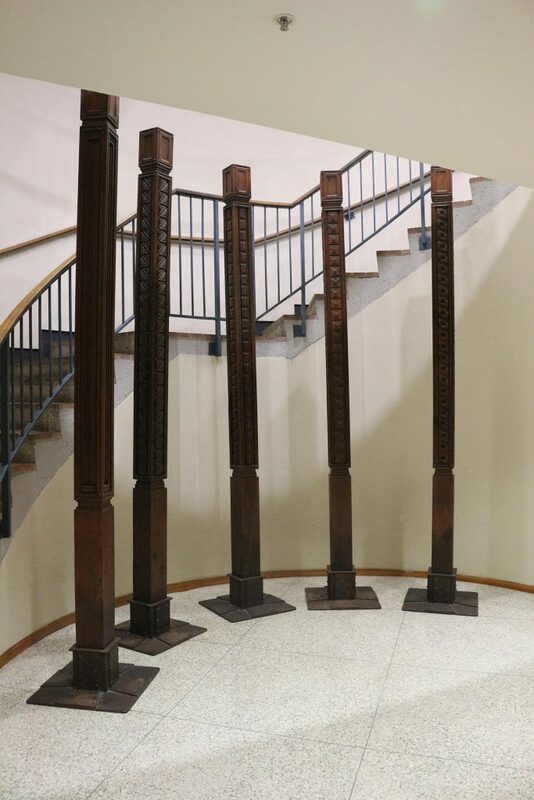 When the first floor was added to the building in 1996, Trinity art professor Kate Ritson was asked to design a piece to adorn the space at the base of the stairs. The wooden totem-like structures entitled Sentries became the first in a series Ritson worked on using repetitive patterns. Please visit the online web gallery to see all of the professional artwork. Future plans call for creating a webpage for the mural as well. However, as in the case of most art, it’s best viewed in person so stop by the library! 1. Much of James F. Dicke II’s 2,500-piece collection is on view at the DAI through July 10.